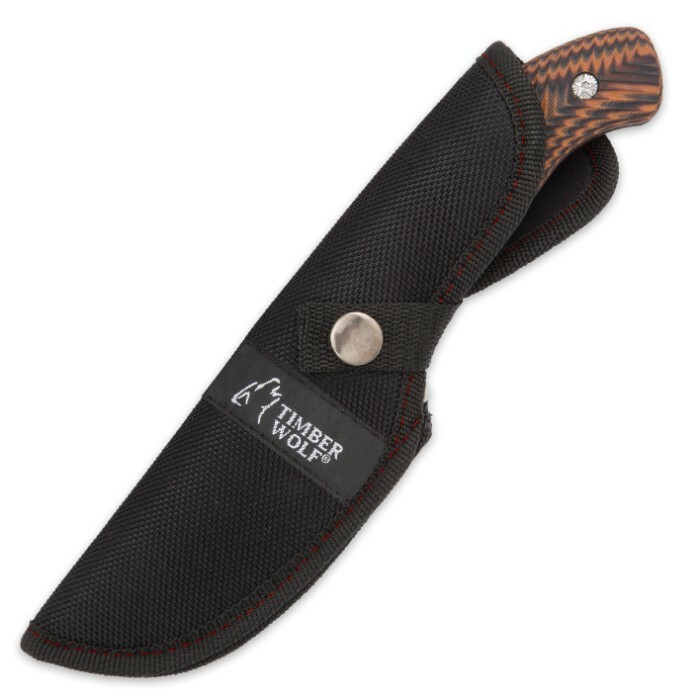 Timber Wolf Pyroclast Fixed Blade Knife with Nylon Sheath - G10 Handle | BUDK.com - Knives & Swords At The Lowest Prices! Boasting state-of-the-art materials, advanced engineering and chic contemporary aesthetics, Timber Wolf's "Pyroclast" represents the apex of modern fixed blade knife design. It's built for hard work in punishing conditions, capably tackling rigorous back country and/or tactical demands with finesse and clout. Every part of the Pyroclast - from the cutting edge G10 handle to the keen stainless steel blade - plays an indispensable role in its remarkable field performance. There's no cost-saving fillers or vain facades, but the Pyroclast is affordable and stylish, nonetheless. 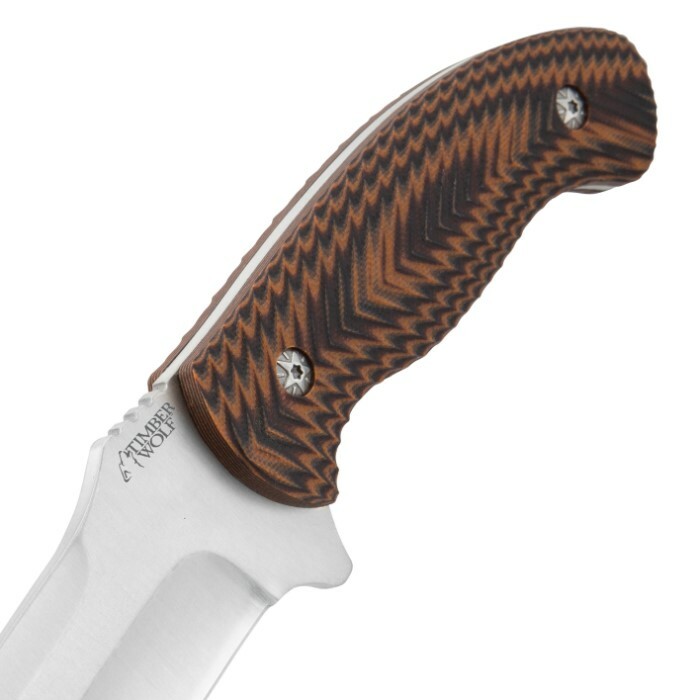 Take the handle's raised chevron pattern; it's undeniably cool, but it also serves a purpose - a stable no-slip grip via its delightfully tactile texture. The handle's G10 construction makes it extraordinarily tough, while remaining lightweight and slim - never bulky or cumbersome and, thus, hard to control. In fact, the Pyroclast is remarkably easy to manipulate - especially vital for fine tasks that require a delicate touch. Thumb grooves at the rear of the blade spine, continuing onto the handle, provide a solid point of leverage, and the Pyroclast's superb weight distribution yields impeccable balance and an overall feel that's second to none. But all of this would be pointless without a potent blade to match. Thankfully, the Pyroclast has you covered in spades. Its 4" stainless steel blade is robust and razor sharp, with angular bevels that yield sleek lines and a fierce profile. The blade's classic drop point form is perfect for skinning, caping, slicing, everyday cutting jobs and a near-infinite range of other tasks, both big and small, rigorous and delicate. At 9" long overall, the Pyroclast is easy to carry in the field, especially when housed in the included heavy duty nylon belt sheath. Maximum versatility. Rock solid durability. Incredible feel. Deadly potency. To put it simply, the Pyroclast is unrivaled - especially when you consider its staggering low price. The Pyroclast represents an unbelievable value - easily the best on the market. Period. So why pay twice as much for a knife that performs half as well? Timber Wolf's Pyroclast Fixed Blade Knife is the smart, obvious choice - for everyday carry, intense wilderness excursions and everything in between. 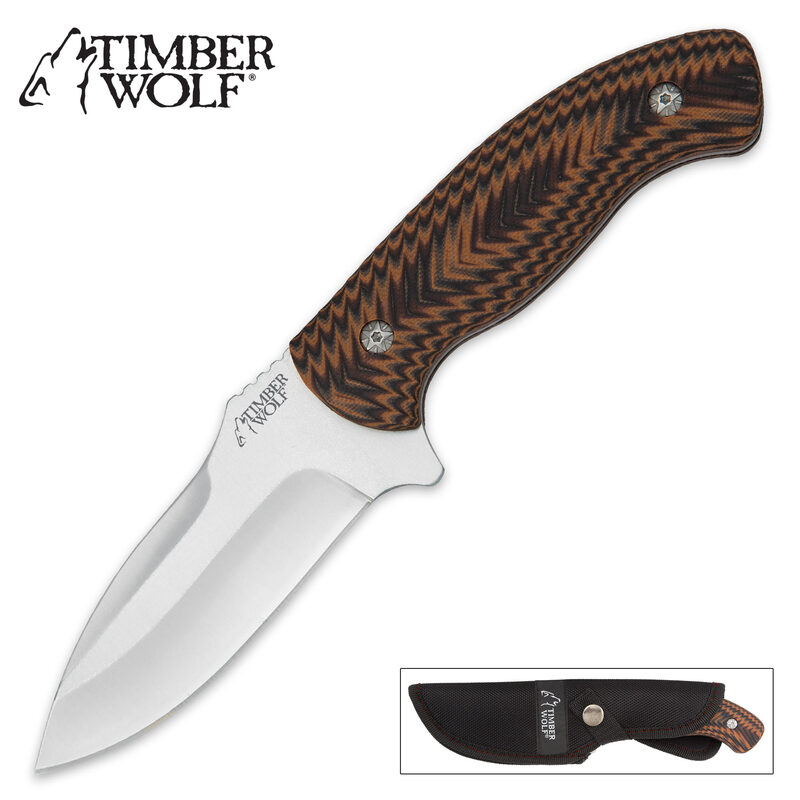 Check out Timber Wolf's matching Pyroclast assisted opening folder (sold separately), as well! bought it's big brother too! I needed a beater, something I could abuse and laugh about it. I've done that with this knife, and after re-sharpening it, I'm impressed with it's performance. I especially appreciate the g-10, it's responsive and has a great grip. Opens with a strong click, easily one-handed closing too. I bought both the flipper / folder and the fixed blade, which is quite a bit larger. Same great handle with g-10 and takes everything I can dish out, and then some. It'll make a great gift too. Buy it, You'll be glad you did. I have bought seven of the pyroclast fixed blade knives they are very solid. This is a edc working mans knife feels good in the hand the G-10 grip are great comes sharp out of the box. I give some as gifts like I say great knives. Sharp blade with heft; good balance and great value. love this knife blade is robust to say the least came sharp like the textured scales sheath is perfect for this knife will carry use it as a edc for sure.